ATTENTION! Please do not be concerned about the ingredients on the product's label, on which a typing error occured. The correct product's composition you can find on our website. 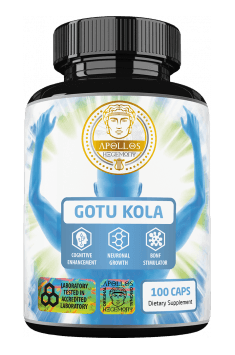 Apollo’s Hegemony Gotu Kola is a dietary supplement containing high-quality extract from Centella asiatica standardized for the content of min. 20% triterpene glycosides and 10% asiaticosides. The preparation demonstrates multi-directional pharmacological activity – it has psychotonic and anti-depressant effects, accelerates the process of wound healing, facilitates circulatory system and its effectiveness has been confirmed in many studies and centuries-old tradition of Ayurvedic medicine. Gotu Kola (centella, Centella asiatica L.) belongs to therapeutic plants. It has been used for thousands years in Ayurveda – Indian natural medicine. This plant has multidirectional effect, slows down aging processes, supports the healing of cutaneous lesions, facilitates the work of the cardiovascular system and supports brain functions. The herb of centella contains valuable ingredients with a proved therapeutic effect. In the composition of this plant there are among others triterpene saponins, called asiaticosides (asiaticoside, madecassoside, centelloside, bramoside), asiatic, brahmic and centellic acids as well as monoterpenes, tannins, flavonoids, vitamins (A, C, E and K) and magnesium. Centella asiatica extract tones the central nervous system, calms down, has anti-anxiety effect, reduces the symptoms of depression and has analgesic properties. Mainly glycosides are responsible for the sedative qualities, which demonstrate the effect similar to gentle sedative drugs. It has been observed that Gotu kola may contribute to the increase of neurons. This plant activates the class of MAPK proteins, which cause the stimulation of BDNF secretion – neurotrophic factor of brain origin, which positively influences the processes of memorizing and reduces anxiety. Moreover, Gotu kola effectively supports cognitive functions, reduces fatigue and facilitates antioxidant processes, thanks to which it counteracts unbeneficial oxidative changes which may be the cause of cognitive problems and neurodegenerative diseases. Scientific studies have confirmed that regular use of Centella asiatica positively influences memory, concentration and associating. Triterpenes contained in Centella asiatica positively influence vascular and perivascular structure of connective tissue. These compounds stimulate collagen synthesis and stimulate fibroblasts contained in vessel walls, which results in the improvement of their elasticity and tightness. Moreover, it protects endothelium and has a positive influence on the drainage of the lymphatic system. Gotu kola also has anti-aggregating and anti-swelling properties and it normalizes the functions of capillaries, thanks to which it mitigates the symptoms of venous stasis and may be used as a means supporting the treatment of venous hypertension, chronic venous insufficiency and post-thrombotic syndrome. Stimulating effect of the extract from Gotu kola associated with collagen production positively influences not only the state of venous vessels, but also the state of skin. Asiaticosides contained in the plant demonstrate anti-inflammatory and antibacterial effects (inhibit Gram-positive and Gram-negative bacteria), stimulate granulation, inhibit the group of enzymes responsible for collagen breakdown and stimulate its synthesis, thanks to which they improve skin elasticity and accelerate the decrease of wound surface. Because of this, the plant may be effective in treating scars, wounds (ulceration, bedsores) and burns. Moreover, this plant has been traditionally used to mitigate acne, psoriasis and leukoderma and also as a means slowing down aging processes of skin – by stimulating fibroblasts to produce collagen and elastin it contributes to reducing wrinkles and counteracts the creation of new ones. It also influences the increase of hyaluronic acid synthesis, thanks to which it improves skin moisture. Summing up, Apollo’s Hegemony Gotu Kola is a dietary supplement improving cognitive abilities which is recommended especially in the periods of intensified mental effort, in the states of depression and in problems with memory. The preparation supports regeneration, reduces fatigue and positively influences collagen production, therefore it is also recommended to sportsmen. Moreover, it may constitute therapy supplementation in the course of chronic venous insufficiency of various origins.